Challenge 13 - Hearts & Romance and our new teamie! Wow wow wow! Thank you for all your entries for our last challenge What's New? Seems like we all had a visit from santa or have (many!) things we've never opened before as we had a record number of entries - 101! Also a huge thank you to the delightful Tracey Coates for beong our special guest. I'm sure we'll be seeing lots more of Tracey and her designs this year and I can't wait to see what she's got up her sleeve! Thank You also to The Stampman for sponsoring our last challenge and I hope some of you managed to catch Jill on C&C last week! Our challenge for you is Hearts & Romance. 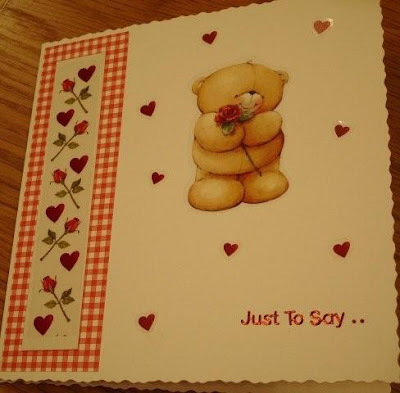 It doesnt have to be Valentines, it could be a thinking of you, with love etc Nice and easy this one! 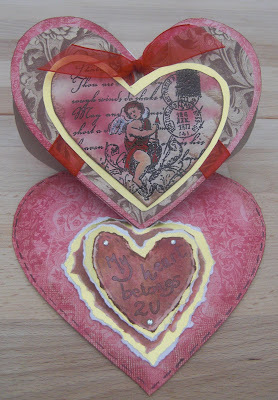 There is a heart shaped easel card tutorial here if you fancy having a go at that, its simples, promise! We're sponsored once again by the ever delightful Joanna Sheen who is currently across the pond at the CHA. Can't wait to see what new goodies she brings back! What's new at Joanna Sheens? "We have a new, beautiful CD called "In Other Words". The illustrations have all been done by Lois Miles and together with a bit of JS Magic there are amazing backing papers and toppers, word cards and stationery sets - everything to make some really fun projects. There's a video in our video section showing you what's inside the CD and some beautiful samples in a separate video too. This is one of those CDs that you will turn to time and time again for something a bit different and oh so pretty! We also have fantastic new Country Life rubber stamps - a new format with a very long thin sheet so lots of value and some wonderful scenic stamps! There is a samples video for those too!" Just a quick reminder - Please follow the challenge and rules. We can only accept up to 3 entries per challenge to make it fair to newer crafters or those who are a bit slower at crafting. Any entries in excess of 3 will be deleted and it does take time checking them all and I know some of you are ever so keen but I have to draw the line somewhere to make it fair to all. Please leave a link to your entry in the comments box below Chelsea's questions and answers below. This challenge closes at 12pm GMT on Monday 8th February. Let me introduce you to our latest design team member - Vicky from Kip's Cards! Vicky has kindly agreed to join our merry bunch and we're thrilled to have her! I'll let her start the ball rolling with some examples to inspire you! Welcome to the team Vicky! First of all can I just thank Vix and the team for asking me to join...I am really excited though a bit nervous, but here goes...This week's challenge is " Heart's and Romance " so I decided to make an Engagement/Anniversary card.I have kept it pretty simple...I think these occassion card's look very elegant in a white theme and not over embelished.I used a decoupage sheet from craft creation's, after cutting and assembling with silicone I sprayed the image with a gloss varnish.Nestie's, Martha Stewart punch, ribbon and a Jewel flourish to finish...oh and a bit of antique linen distressing ink that I added sparkle to with ultrafine glitter. I used a pale green card and then in the centre of it added a square of silver textured paper and added a circle of bronze coloured paper and arranged 4 different coloured hearts so that the points at the bottom of each of them was on the circle and the top of the hearts were in each corner of the square paper, next I added two small strips of double sided tape to the circle and added the top layer of heart shaped pieces so that they are in line with the first layer, next I added four larger heart shapes to each corner of the card & finished it with a "With Love" sentiment & a circle of silver glitter glue to the centre of my Heart Flower. I have made a simple card for this challenge, with simply matting papers and using stickers. I think it just shows that a simple technique still makes a nice card. I used sketch # 150 from CPS for the layout and was initially inspired to incorporate the packaging from some Papermania spotty buttons that I had bought to make a shaker card. The heart paper is an old HOTP one. The red paper and letters are from a freebie paper pack from a magazine. The Forever Friends bear is a sticker and the flowers are various Primas layered together with a silver beadcap and a spotty brad on a Sizzix diecut corner. Now let me have the pleasure of introducing our special guest for you for this challenge who is Chelsea from Crafting Life's Pieces. Chelsea first came to my attention when she entered our challenge 9 with some jaw dropping work. I had a good look round her amazing blog and saw she was uniquely talented, she doesn't make cards, she makes masterpieces, each one a work of art. I asked her there and then if she'd like to special guest for us. Pop over to her blog, you wont be disappointed! Chelsea also has her own range of stamps - Gurlee Girl which she has used one of them on her design for us. Thank you Chelsea! 1. How long have you been crafting and what kind of things do you make? I have been crafting since my high school days. I enjoy making cards and scrapbook pages. 2. What are your favourite materials to work with? I have a couple of those! First would have to be papers, flowers, lace, and charms. Other favorites includes paper punches, chalk ink, ribbons, and my sewing machine. 3. What do you most love about your craft(s)? I love the fact that I'm able to bring my ideas on to paper. It's one thing to see it in your head, but it's another when the completed project in front of you. 4. What are your achievements and future plans? My biggest achievement was launching my Gurlee Girl stamp line back in July 2009. I look forward to adding more cute images to my collection and expanding my online shop. 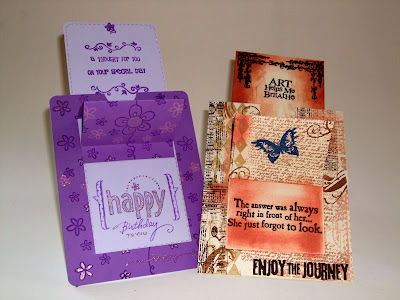 Welcome to our first tutorial on using distress inks. There are so many uses for them and this tutorial is to show how to make easy peasy backgrounds that can be used for several styles of design. For this you will need a craft mat that wipes clean. I personally use a non stick cooking sheet I bought in the pound shop. Step 1 - Select your colours, minimal or multiple, they all look good together and you never get a "bad" background! For this I have used vintage photo, faded jeans and spiced marmalade. Start with your lightest colour and dab and swipe this on the sheet randomly (or organised, its your sheet!) Repeat with your darker colours. Take a piece of card and lay this over your wet ink, move it around to pick it up. If there are any white spaces left then just lay the card down and repeat. The more water you add the lighter the colours will be so if mine looks too light I dab the ink back on and do it again until I'm happy. Also they will dry lighter than what they look like wet so bear that in mind. You can also dab them on direct to paper (DTP) and leave them as they are to make patterns as in the pic below. For this finished piece I simply stamped and tore around the image then I used a piece of sponge to push some brown distress inks around the edge. I hope you have a try with this technique, there's nothing better than creating your own backgrounds and papers, have fun! I hope you all had a wonderful new year and have stuck to the resolutions hehe! With all this snow and ice around I think its given a little extra time for crafting! Many many thanks for all your entries to challenge 11 favourites, so much variety but I think promarkers and copics are clearly a hit! Also thanks once again to Joanna Sheen for sponsoring us and to Vicky for being our special guest. 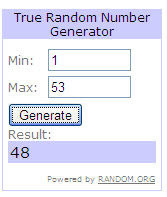 Number 48 which is JODI! 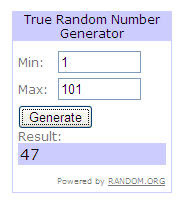 Well Done Jodi, please email me your details so your Joanna Sheen prize can be sent to you, enjoy enjoy! Well Done ladies and please grab your Top 3 blinkie from the sidebar, fabulous creations! We're also changing the format of the challenges slightly in that the special guest designers will also give a short interview with their top tips to help you along which will be at the bottom of this post. Also if there are any tutorials you would like to see please pop them in this thread here and I will work through them. You can also email in any questions if you're a bit shy to ask! Righto onto Challenge 12 which this fortnight is sponsored by the one and only Stampman! I saw many of you taking part (and winning!) 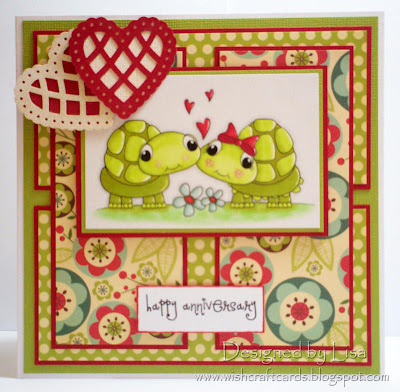 in the recent Stampman blog hop and what a lot of fun it was too! The Stampman also have a £10 voucher to use in their shop and what a lot of goodies you'll find there such as starburst stains (If you havent noticed I use these in practically everything I make lol!) and some wonderful stamp plates by Tracey Coates and Kay Carley. They also stock DVD's, distress inks and some of the yummiest embossing powders you'll ever see and thats just the starters! Pop on over and check them out as there is so much stock to suit every craft taste! Our challenge this time is What's New? Did santa bring any new goodies or did you buy something thats still in the wrapper (guilty!) or maybe you're learning a new technique? What's new to you? Here's what's new to our ladies and many thanks for doing a brilliant job once again! I used a green card from my stash, added a small square of red homemade (not by me I might add ) paper putting it on the card so that it is diamond shaped, then added a second cream piece ... both pieces were fixed using double sided tape, I then added some pale blue flock flowers onto the cream paper, a couple of butterflies, one at the top point of the red card & the other at the bottom point of it, and finally added some red flock flowers towards each corner and the word friends in the pattern. New to promarkers I was pleased with the way this card has turned out. They were a Christmas present and was a new technique for me to use. I started with a blank square card, and covered it with the backing paper, I recently purchased some new digi stamps of which this image is one, which I coloured with the promarkers, I matted the picture onto some miri card and mounted it onto the layers of backing paper. 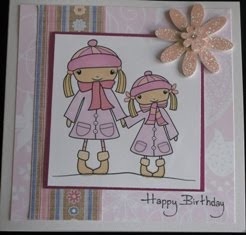 I stamped the greeting and added the flowers and gem in the corner covering with a little glitter. I've used a new stamp, Riley Moose enjoying some chocolates (can't remember what it's called! ), coloured with promarkers. A friend gave me the paper so I'm not sure of the brand. The sentiment is a Penny Black stamp that I've cut out and edged with distress inks. Green Tara flowers with a button centre and some little pink pearls to finish. I have used my new Sizzix scalloped die to cut the base sheets of card and linked them all together using eyelets and jump rings. The papers I used are mainly from a pack called Bloom & Grow from My Minds Eye. I found myself succumbing to this gorgeous pack of papers whilst shopping only yesterday! I have embellished the pages using chipboard numbers from Poundland which I coloured in black. The butterflies, scalloped circles and journalling tag on the last page are from a freebie pack of papers from a magazine as the colours all matched so well. The rest of the flowers and leaves were cut from the MME paper pack and have been mounted using 3D foam squares.I have covered the leaves with Rangers Glossy Accents and added a few buttons. A couple of glittered brads, a liberal sprinkling of Stickles glitter glue and as Gordon Ramsey says DONE! Notebook - I replace the cover with a new one create from Tempting Turquoise SU Card. Added a smaller piece of card at the bottom. Added strips of ribbon and then a the flower with a blue pearl in the centre. Tilda was coloured in with Copic's and then I added highlights with Spica Pens. I used Glaze on her shoes and the Cat nose. I added faux stitching using black pen. Card - Tilda is decoupaged and coloured as for the note book. I cut a card blank from Tempting Turquoise. 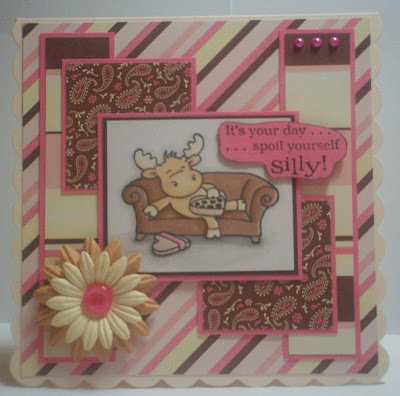 I cut a piece of Creamy Caramel card and added strips of the ribbon and then stick it to the card blank. I cut a circle from Tempting Turquoise using a Nestability Die and then a scalloped one from the paper mill card. Then I put this on the the card. I stuck Tilda to the circle. I again added faux stitching. For the inside I cut two squares from the paper mill card and then stamped flowers from the doodle stamp set and added spica to them. These I then stuck inside. May I now have the pleasure of introducing our special guest for this challenge which is TRACEY COATES! 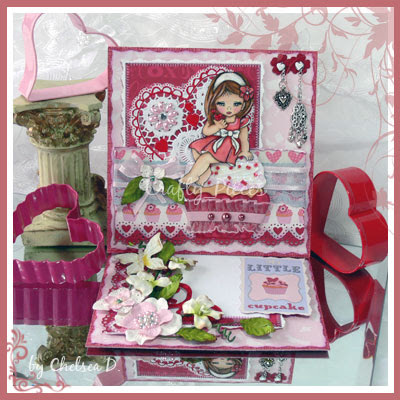 Her name might be ever so familiar to many as she is the very talented designer for The Stampmans new range of stamps; Starburst Fairies, Butterfly Beauties and Classical Instruments and has appeared on Create & Craft doing live demos! Tracey has sent us two lovely designs to show what a difference different colour schemes can make to the same design. I have always been arty, I have even got a degree in it! I have been Card Making for about 6 years and a demonstrator for 4 years, but it has only been the last 2 years that I have been designing rubberstamps. I love making Altered books and often take my ideas to canvas. Made the odd sculpture too. I love Stamping, and I love using my chalks, but love paper most of all buying at least 2 of each, one to use and on to stroke! Do you know it's the crafters themselves. No matter where you are you will always meet a friendly crafter willing to share their secrets and have a laugh and a chat. I have been very fortunate to design some rubberstamps for The Stampman. As far as the future is concerned some more stamps are in the pipeline, more TV and some other very interesting developments that have to stay under wraps at the moment ( my lips are sealed!) Lets just say you might be hearing and see lots more from me in 2010!!! 1. If you are into distressing, I find make up sponges good for applying ink and cheap too try your local pound shop. 2.Keep you tools clean, rulers,scissors, knives etc. I use lighter fuel on cotton wool it a bit smelly, but boy does it get rid of all the gunk and sticky stuff. 3.Put a strip of double sided down you card and then rub chalk all over the strip it turns into silky ribbon, blend different colours to match your card. Firstly I hope you all had a wonderful New Year and are sticking to those resolutions hehe! A huge thank you to everyone for taking part in our challenges and I hope you continue to join us regularly!